We all know the story of Bruce Wayne/Batman. If you don't know the origin, then you really need to read this book. Geoff Johns scripts the Bat for the first time as a solo hero. Set in the same universe as Superman: Earth One from last year, it first reads like a re-imagining of Frank Miller's iconic Batman: Year One. This version finds the newly anointed Dark Knight taking a more vengeful path than Miller imagined 25 years ago. It also finds our beloved Alfred Pennyworth as a much more grizzled war veteran of Her Majesty's Royal Marines. Even Bruce and Gordon are somewhat different, as they are both quite embittered at this point. Even a well-known villain seems more ruthless and far more politically minded in Johns' version. This is a perfect jumping-off point for anyone who needs a refresher course on the Caped Crusader. 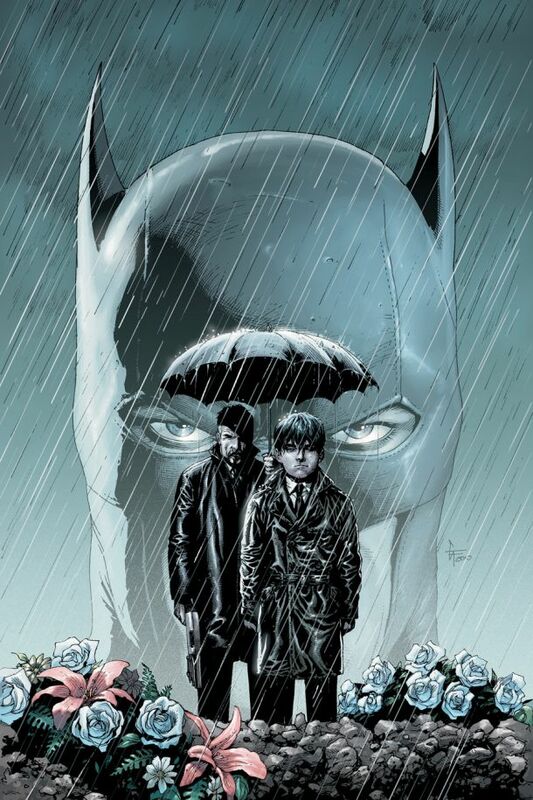 It covers both his parents' murder, giving a new culprit, and his first year as the Batman. We even get a look at a fresh-faced and fully sober Detective Harvey Bullock. Not yet the fat and cynical Bullock that many of us grew up with in the Batman animated series, he is much more optimistic and full of untapped potential. Oswald Cobblepot happens to be the mayor of Gotham City and we see Barbara Gordon before she dons her own cape and cowl as the original Batgirl. Aside form the faces we see, there are many differences between Earth One and the dwellers of Gotham we've come to know and love. It begins at a brisk pace and ends with a bang. I know the last two have been written by Geoff Johns, but that's only because they were the best example I could give form the past week. This, however is the best example of a graphic novel I can give for the whole year. The pacing begins briskly, but it maintains a steady stride the whole way through. He writes established characters with a wonderful ease and introduces delightful new elements into their being. It's easy to forget that the traits weren't there all along because it fits Frank Quietly Gary Frank's pencils so well. There's another man who has done well on this, Mr. Frank Quietly Gary Frank. Better known for his work with Grant Morrison on various Superman graphic novels, he lives up to expectations here, at times surpassing them. Jonathan Sibal's inks and Brad Anderson's colors fit the noir landscape of Gotham like a black velvet glove. I honestly cannot find anything I would add or subtract from this book. It's full of the grit that Gotham is know for and with plenty of color in the right places. Full of realism and functionality, I have to give it an A. No other grade will do it justice, which what the Goddamn Batman (...I had to...) is all about. Editor's Note: Thanks to Marquis Samedi for reminding me that I screwed up. It has been edited to show what happened. My bad, I'll do better in the future. Psst … Frank Quitely didn’t draw this. Damn, got my Frank’s mixed up. It’s Gary Frank. Editing ASAP.